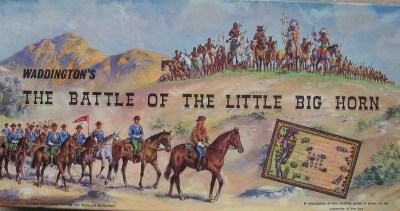 One of the most epic battles in North American history was fought in 1876, between General Custer and Chief Sitting Bull at the Battle of the Little Big Horn. This game, of the same name, was first published by Waddingtons in 1964. The Sioux and Cheyenne Indians were increasingly hostile to the prospectors pouring across North & South Dakota. Three columns of U.S. Cavalry were dispatched to subdue the Indians. General Custer was sent ahead to make contact, but instructed to await support before attacking. However, nearing the Little Big Horn River, Custer decided to attack at once - what he did not know was that Chief Sitting Bull had assembled an unusually big force of 4,000 braves!